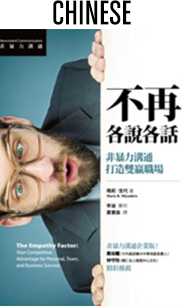 In this groundbreaking book, award-winning communication and organizational strategist Marie Miyashiro explores the missing element leaders must employ to build profits and productivity in the new economy. That missing element is empathy. 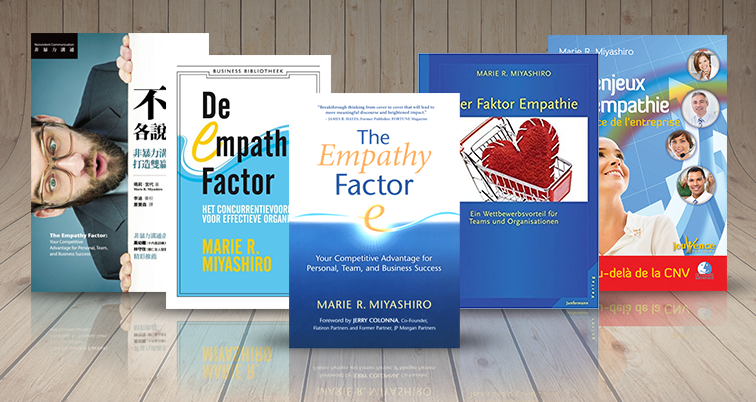 Marie builds from the latest research in brain science, emotional intelligence, and organizational theory. She offers both real-world insight and a practical framework to bring the transformative power of empathy to your entire organization. Marie’s approach combines more than 26 years of experience advising for-profit companies, government agencies, and nonprofits. She helps substantially improve organizational communication with a proven, world-renowned process from the largest empathy-based community in the world. 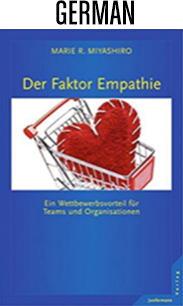 The Empathy Factor takes Dr. Marshall Rosenberg’s work developing Compassionate Communication into the business community via Integrated Clarity®—a powerful framework you can use to understand and effectively meet the critical needs of your organization without compromising those of your employees or customers. 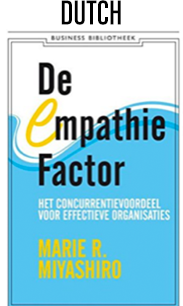 Need copies of The Empathy Factor in French, German, Dutch or Chinese? We’ve got it!